It was, “Will ye learn Greek and Latin? Or will ye run me a race? And ran it right into his brother. When flung from the top of the brigg. It quite gave them an appetite. “My brother, you didn’t had ought ter! To indulge in the pleasure of slaughter? And a perch has got hold of my knee. We are both in the selfsame condition! And you have your perch in the water. Since my heart was accustomed to feel. You are better off here with your perch! Is much better than thirty a day! So it need not be reckoned at all. “Do you see that old trout with a turn-up-nose snout? He’s the one I like best in the stream. And we’ll settle what time we’re to meet. And answered with wisdom to boot. Than lying all snugly and flat? Has Nature a picture like that? Of fish full of life and of glee? To kill them than let them go free! Rejoicing in Life and in Motion. Is better than twenty of that! To pull a fish out of the Tees? The tear stood in her e’e. A simpleton he must be! “Oh woe and dole is me! “I’s mighty wicked, that I is! Or how could such things be? Here is chapter 4 of that sci-fi novel I haven’t named yet! Sorry this is a little late! It’s been a while since I’ve given you guys one of these (about two months I think), so here is chapter 4 FINALLY. Click the following links for the prologue, chapter 1, chapter 2, and chapter 3! Disclaimer: these chapters have not yet been professionally edited so there will most definitely be mistakes that I didn’t catch. Also this series contains violence, moderately strong language, and a touch of gore. Reader discretion is advised. After five days of order intensive soldier training—curtesy of Lucas Cain—Kira and Artemis were nearly ready to infiltrate the N.E.S. Bengal. They had both been taught how to salute properly, how to reply to a superior officer, as well as how to address people who ranked lower than them. They’d been through Obstacle courses designed by Cain to simulate military training and it was no surprise to anyone that they both passed the physical assessments with flying colors. It was true that Artemis was more physically inclined than she was, but she was still much more skilled at combat than most people her age. Regardless, she was expecting to be underestimated, thus she’d worked twice as hard as Artemis to see to it that she was at least on par with him. Thanks to Artemis’s vast knowledge of multiple martial arts, he was able to flip and spin his way through Cain’s difficult laser trials, while Kira had to run and dodge to keep herself from getting burned by the beams. There were a few times that she’d been tempted to just shoot the laser projectors and be done with them; however, she refrained knowing that sort of exercise was good practice for beating more complex security systems that were ‘un-hackable’—although she had yet to meet a system that she couldn’t hack into. Kira liked Cain. Yes, he was strict and at times difficult to get along with because of his severe personality, but he was very good at getting she and Artemis to give it their all in every task he had them do. It was hard work, but Kira felt as if she had learned a lot about how to be a convincing Tora Corp solider—she only hoped the Tora Corp staff would feel the same. Another day of training had finally concluded and Kira and Artemis sat in the middle of the bunker’s vacant training grounds—a large empty section of the base that Cain had used to project his laser obstacle courses. Cain had since ended the projections and was in the midst of packing up his state of the art lightdrives and other modern tech which Kira envied. With a simple flick and swipe of his fingers, Cain opened up a translucent light screen in front of him, typing in a few things. “I thought only data chips could support lightbeam interfaces,” Kira said as she watched him. “What? You think ghosts and vampires are helping them out or something?” Artemis asked with a snort of a laugh. Kira and Artemis discreetly glanced to one another, both looking reluctant to the idea. “With all due respect, Mr. Cain, Artemis and I are only going to the Bengal to steal a sample of Tora Corp’s new MCTA prototype. We’re thieves, not spies,” Kira said. “Those aren’t exactly the words I’d choose, but, in a sense, yes,” Cain replied. “Well, at least he’s upfront about it,” Artemis said with a shrug. “Yeah he is,” Artemis muttered sourly. “Can ‘early’ be like ten-thirty?” Artemis asked, smiling hopefully. “Nice try, Mr. Flynn. I’ll see you at six,” Cain said as he strode out of the white warehouse-looking room, leaving Artemis and Kira to stand there alone. “Good. Me too,” he said, patting her arm. “We’ve got this in the bag, K.” He then brushed past her, whistling one of his favorite rock and roll tune as he too left the training arena. “Awesome. But aren’t they gonna check for outside tech?” Artemis asked. She could feel the anger bubbling within in her chest as the memories of her former comrade and friend flooded back to her. Artemis was right. It had been three years—she should have gotten over it by now. But the fury she felt each time Elliot’s name was brought up never went away. Her hands tightened into fists, her nails biting into the palms of her hands. “Noire and I knew him for twelve years and you knew him ten—I just don’t get how someone could betray people who they’ve known for so long,” Kira whispered. Kira strolled down an aisle of whirring and beeping machines as she made her way back to her room. She had lied when she told Artemis that Elliot would be the last thing on her mind. Elliot was going to be the very first thing on her mind. She was going to keep him in the forefront of her thoughts to motivate her. She was going to prove to him that they didn’t need him and that they were doing just fine without him. She suddenly paused, hearing voices from just up ahead. Is that Noire and Cain? I thought Cain left for the day, she thought, slowing her gait and tiptoeing forward so as not to alert them of her presence. She peered around the side of a machine that controlled the bunker’s emergency laser barriers and saw Noire and Cain standing in a small nook-like space with a few chairs and a small table. “How long until you’ve got the memento viewer up and running?” Noire asked. “Six months at the very least,” Cain replied pouring an amber-colored liquid from the automatic kettle and into a glass cup. She thought she recalled Noire refereeing to the drink as ‘tea’, but she had never had any. Tea was scarce along with any other food item that wasn’t processed into tablets, which is why Noire saved most of his rare things for special occasions. “Why so long?” Noire asked, taking a seat in one of the chairs. A memento viewer? Kira thought. Why would the Timber Organization need one of those? That’s really old tech. Kira’s eyes widen. They were talking about her? If that was true then it would certainly explain why she couldn’t remember anything before the age of five. Had they wiped her memory, and, if they had, what for? Noire said nothing more as Cain got further and further way, his footsteps fading and the sound of the entrance hatch opening and closing behind him. Kira pressed herself to the box-like machine she was listening from and tilted her head back to the domed bunker ceiling far above. The empire was chasing after her when she was a child? What information could she—a kid at the time—have possibly possessed that was so important to them? It didn’t make any sense. But she did know one thing for certain: she had to find out what was on that extracted memento. Not for the empire’s sake, but for her own sake. That was a stolen piece of her life and she wanted it back. Noire had kept something vital from her for sixteen years and she was going to find out what it was even if he didn’t want her too. She had gone along with what he said for long enough—it was time to find out about her past, and her family, and who she really was. It was time she got the answers she deserved. Well, look at the bright side, she thought, despite the sinking feeling at the pit of her stomach. At least I’m not thinking about killing Elliot anymore. Hello everyone and happy Saturday! Since you guys seemed to like Scarlet’s illustration breakdown, I decided to post Nicholas’s! 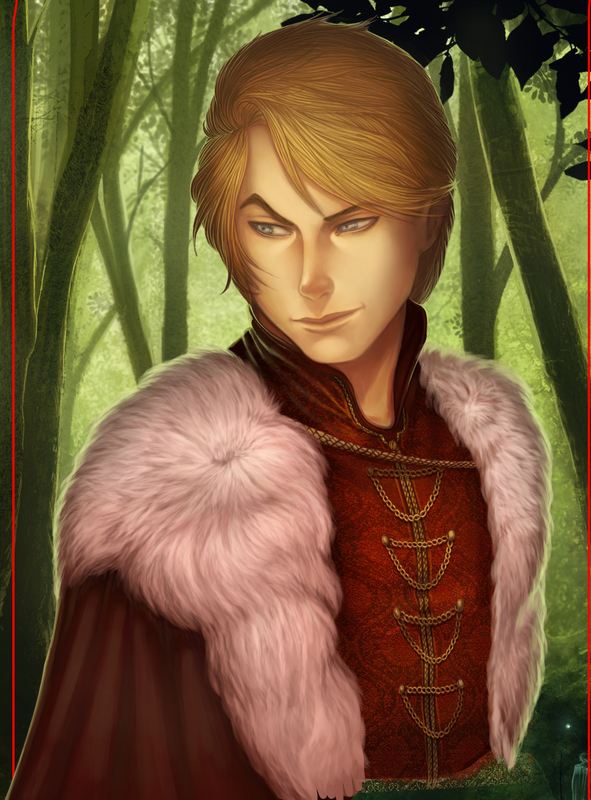 Again, these artworks are by the super talented Enrica Angiolini, my illustrator for The Prince of Prophecy series. 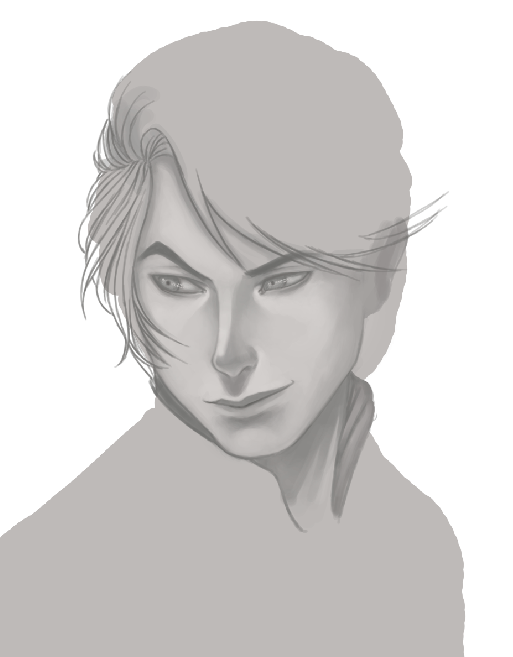 Creating characters is quite a process, not only for authors, but for artists too. Sometimes this task can be daunting, but luckily for me Enrica is a professional in every regard and we were able to create some really gorgeous looking characters. 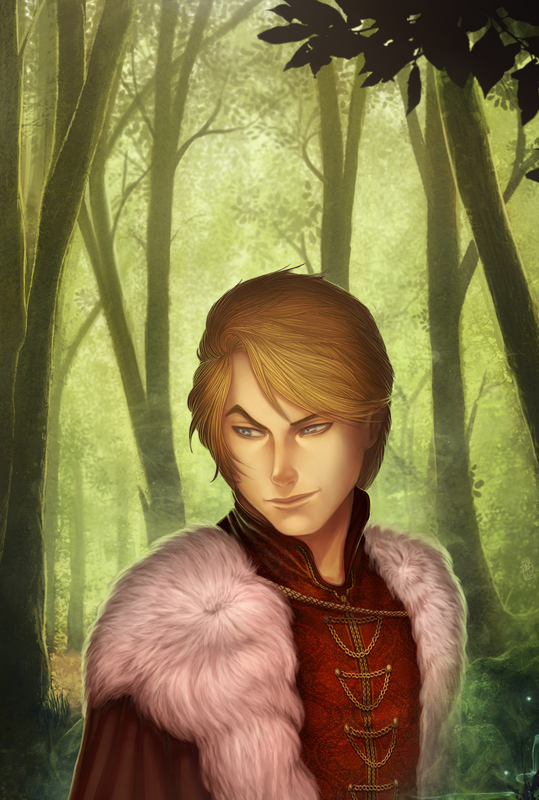 With the face models and written descriptions I provided, Enrica was able to bring Nicholas (as well as all of my other characters) to life. And voila! Isn’t he such a handsome villain? 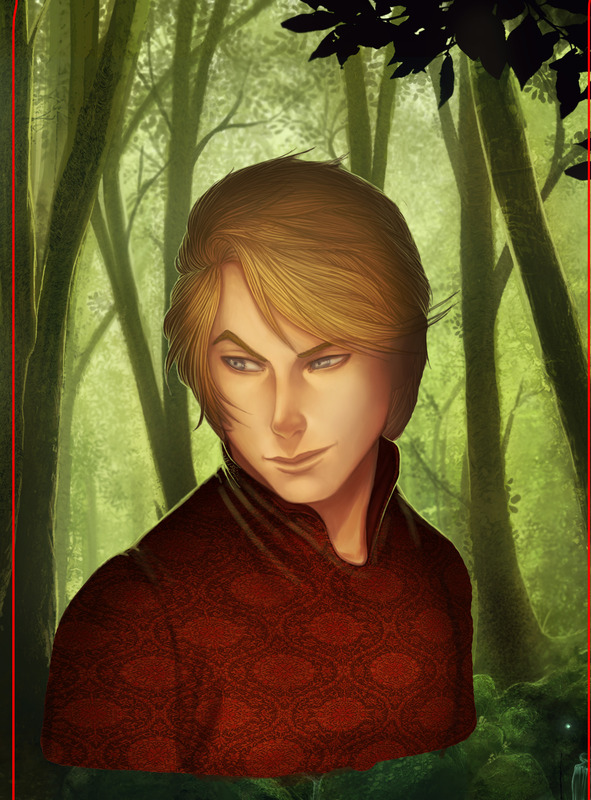 If you’d like to learn more about Nicholas (and see more of his illustrations), purchase copies of The Prince of Prophecy Vol. I: Destined and The Prince of Prophecy Vol. II: Cursed. Both books have excellent ratings on Amazon and B&N.com, and they’re great reads for anyone who likes fantasy, adventure, and fairy tales! Then he ran all round his house, and saw that the little window was open, and thought, “I will look in and see what she can be about, and why she will not open the door for me.” He tried to peep in, but could not get his head through because of his long beard. So he first put his beard through the open window, but just as he had got it through, Mother Mansrot came by and pulled the window down with a cord which she had tied to it, and his beard was shut fast in it. Then he began to cry most piteously, for it hurt him very much, and to entreat her to release him again. But she said not until he gave her the ladder with which he ascended the mountain. Then, whether he would or not, he had to tell her where the ladder was. And she fastened a very long ribbon to the window, and then she set up the ladder, and ascended the mountain, and when she was at the top of it she opened the window. She went to her father, and told him all that had happened to her. The King rejoiced greatly, and her betrothed was still there, and they went and dug up the mountain, and found Old Rinkrank inside it with all his gold and silver. Then the King had Old Rinkrank put to death, and took all his gold and silver. The princess married her betrothed, and lived right happily in great magnificence and joy. 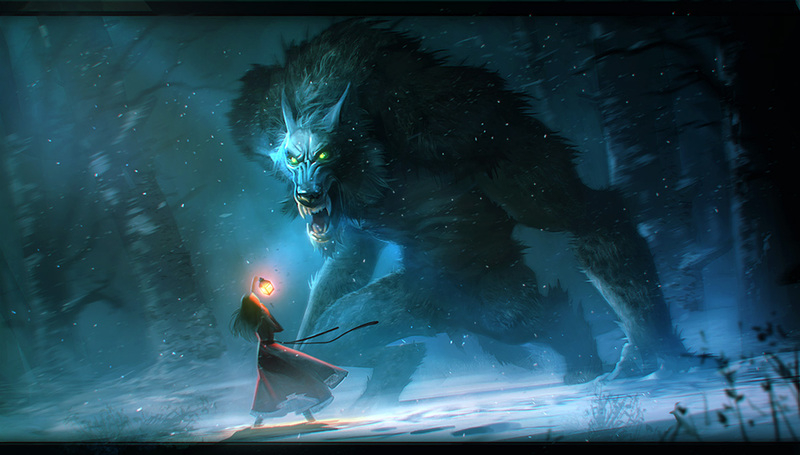 It’s not unreasonable to say that modern day bag guys or “wolves” (as I will hence forth refer to them as for the rest of this article) are much more fearsome and dangerous than any of the ones written about in original fairy tales. Why? It is my belief that we, as a society, have groomed and fed our “wolves” by teaching our children that the world is a dangerous place that they shouldn’t explore alone. Granted, it’s far too late to give our children free reign now that the damage is already done, but it’s arguable that by teaching our children to fear and be wary of everything and everyone in the world we have made the “wolves” that much more clever and sinister. Wolves still need to eat after all, they’re not just going to take the lack of children wandering down lonely forest paths in stride. And they haven’t. Now the wolves, witches, and warlocks (the bad guys for all intents and purposes) seek us out since we no longer stumble upon them. What does this mean for our children? It means they should be afraid and so should we. We’ve destroyed the Little Red Riding Hoods, the Hansel and Gretels, and the Goldilocks of the modern world by teaching our kids fear when we should be teaching them caution. If you threw a modern-day kid into one of these fairy tales, they wouldn’t fare well because they wouldn’t know what to do or how to defend themselves—even us adults would be a bit perplexed without the use of our smartphone GPSs. Why is this? Because in the real world, us adults seldom give kids them the chance to stand up for themselves and handle their own problems. Now when our kids get bullied at school, we, as parents, turn it into a full-blown court case. I don’t know about the rest of you, but when I was in school and got bullied by mean kids I learned to handle it by myself—my parents only stepped in when absolutely necessary. We’ve got to prepare our kids for the world, and we can do that by not constantly running to their aid every time a rude, little jerk at school calls them a mean name. No one wants to see their child unhappy, but if they can’t handle minor problems in third or fourth grade, how can we expect them to handle major problems in the future? Let go a little, parents. Easy up on the reigns! Give them the chance to show you that they can resolve things by themselves and they won’t disappoint you. Now, I know what you’re thinking: how do you expect my kid to stand up to someone who’s trying to abduct them? The answer is simple: we start teaching kids how to be clever and smart. Instead of letting them watch mind-melting cartoons all day or play on their computers/ipads/smart phones right after school, hand them a book of Grimms Fairy Tales—heck, hand them any book. Then maybe when someone is bullying them they’ll remember the lessons learned in those stories they will be better equipped to avoid trouble and stand up for themselves. They’ll learn perseverance, honor, kindness, truthfulness, and all the wonderful things that those classic stories teach. So when that brutish little wolf pup, or witch-in-training starts pushing around your Little Red, Hansel, or Gretels they won’t be afraid to deal with their adversaries themselves. Yes, some of the original fairy tales are violent and grim, but you’ve got to understand that reading those stories to your kids is not going to turn them into psychos—let’s give our kids a little more credit than that, people. By reading them these classic, unabridged stories you’ll be preparing your children for the real world—a world that’s not always sunny and happy. These stories have been told to children for centuries and the world has yet to be overrun by violent little Peter Pan wannabes. I think our kids will survive an unabridged, un-sugarcoated short story or two without going on a rampage. Bottom line, the wolves of the modern-day world are stronger than ever before because we’re killing our heroes and heroines—or at least weakening them significantly. We’re feeding the beast by not reading our kids these classic stories. By over protecting our children we’re making them cowardly, naïve, and wholly unprepared for the world full of wolves outside our triple locked doors. Stop feeding the wolf. Give the heroes power again. Read your Little Red a fairy tale. This week’s artwork is by Niconoff! You can view more of his artwork by visiting his Deviantart Page! For new fairy tale, Prince of Prophecy, and Writer’s Corner updates every Wednesday and Saturday, follow this blog! 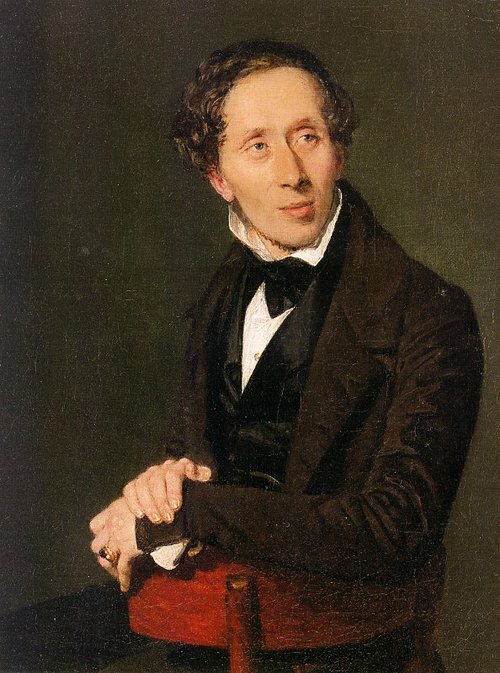 For those of you who didn’t already know, Hans Christian Andersen’s birthday was on the 2nd of April. I’ve already done a fact post about HCA, so if you want to check that out CLICK HERE. 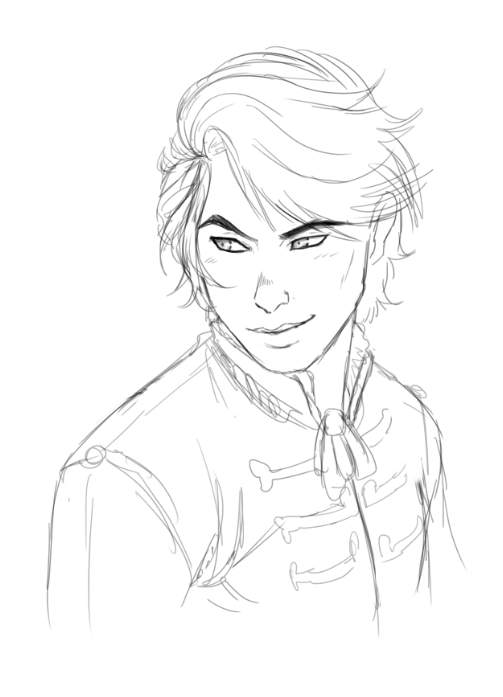 People seemed to like what I did for Wilhelm Grimm’s birthday (I posted a scene from my book including him and Jacob), so I decided I would do the same thing for Andersen this year. The following scene is from my second book The Prince of Prophecy Vol. II: Cursed, and it’s right after you first meet Hans. I’ve always really liked this scene and I wanted to share it with all of you literary aficionados. I hope you guys will enjoy it! Destan spent the rest of the day talking with Hans and trying to make him feel more comfortable with his new surroundings. The prince had showed the Danish boy around the castle, the gardens, and had even taken him to the castle ruins. Hans seemed absolutely enchanted at everything the palace grounds had to offer. The exotic flowers, the hedge maze, the tennis courts—Hans’s eyes lit up a little more with each new discovery. By the time they came to the end of their tour, night was fast approaching and the stars were just beginning to appear in the deep purple sky above. “What happened to your father?” Destan asked gently. Hans only shrugged, saying no more. Destan took pause to seriously consider this question. “Well, I wasn’t frightened of her. I was frightened that if I didn’t act I could lose all of my friends, not to mention myself. I didn’t have time to let my fear hinder me. Instead I harnessed it and used my fear as my motivation to succeed.” Is that what I did? he thought. I suppose I’d never analyzed it until now. “It wasn’t a matter of courage. It was a matter of desperation. I couldn’t lose my friends—I have too few of them as it is,” Destan admitted with a feeble laugh. “I prefer ‘servant’,” Destan interjected once more, his frown becoming even more prominent as Hans continued on with his version of the story. “—But when she got there and saw that you were just a shell of your former self, she wept, and the tears of her love and devotion for you melted your icy heart. Then you awoke, proving that true love conquers all!” Hans cried, shooting his fist into the air and grinning triumphantly. “That’s what I wrote about anyway,” he said, bashfully lowering his hand. “You wrote a story about me?” Destan asked. The two then headed back to the castle, speaking no more of either version of what happened at the Snow Queen’s palace, much to the prince’s relief. Why is it that I’m always made out to be the damsel in distress? Destan thought as they silently made their way up the garden path. For once, I’d like to be the hero. and forget not the day is for sleep. the Tiger, the Panther, and Bear. and mock not the Boar in his lair. it may be fair words shall prevail. and the Pack be diminished by war. not even the Council may come. and so he shall change it again. and your brothers go empty away. so leave him the head and the hide. The Kill of the Pack is the meat of the Pack. The Kill of the Wolf is the meat of the Wolf. the Pack may not eat of that Kill. Cub-Right is the right of the Yearling. and none may refuse him the same. Lair-Right is the right of the Mother. he is judged by the Council alone. the word of your Head Wolf is Law. and the haunch and the hump is — Obey!